Email-forward allows you to receive voice mail messages via email. When you open the email message, you can listen to the message, save it on the hard drive, or delete it. Because the message is simply an audio file attached to an email message, it’s possible to forward the message to anyone via email. The caller’s phone number is included in the subject of the email message. Check your Email as you normally would. When you get a voice mail message, you will receive an email from ‘WesTel_Voicemail’ delivered right to your inbox. The message will have an attachment. Open the attachment and your media player will play the message. If desired, save the attachment on your computer. 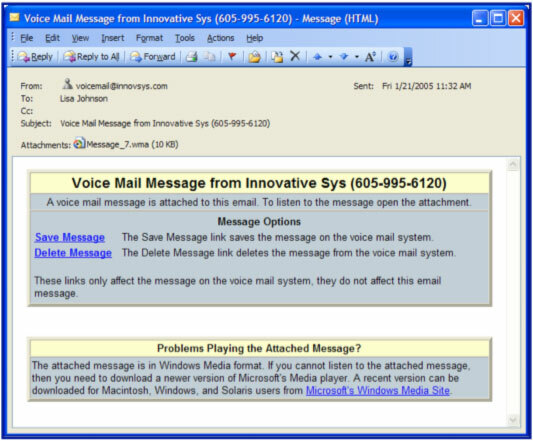 Follow the links in the message to save or delete the message from the Voice Mail system. Click the Save Message link to save the message on your voice mail service. This will NOT affect the email. It will remain in your email folder until you remove it just like any other email you receive. Click the Delete Message link to delete the message from your voice mail service. This will PERMANENTLY DELETE the message from your voice mail system. This will NOT affect the email.